Sentiments/Non-Humans: People are just people. Who cares what kind of people? People are people. Sentiments/Coalition: It's amazing a bunch of ignorant meatbags got as far as they did. Mech came up with the term to describe these people. Disposition: Attempts to be coldly logical at all times. Sometimes his emotions bleed through. Insanity: Obsession: Design - Does not know when to quit when designing/building things. Prone to over engineering. Description: A humanoid with luminous eyes and metallic blue skin. • Meld with metal and alloys to armor self. Add up to 1d4X100 M.D.C. Add 2D6 inches in height and 1D6X100 lbs to weight. Not usable inside of a vehicle. • Reshape body configuration to add metals and become stronger. Add +10 to PS. • Change basic shape. Halve height and width. Limbs can be extended up to three times their normal length and the body can be made small and thin to slip through bars, restraints, etc. Looks incredibly grotesque. HF 12 for those unfamiliar with the process. • Meld with a hand weapon like a sword, axe, etc. +1 to strike and parry. • Extrude cables from limbs and take control of any machine that can be connected to. Bypass controls and become directly linked to the machine. • +15% to all piloting rolls. • Automatic robot or power armor combat elite with a melded robot/power armor. • Equivalent of a universal head jack. • Add +15% to all computer operation, programming and hacking rolls, +15% to electronics, mechanics or most forms of machine operation/repair. • Once a successful meld has been completed (1d6 melee rounds) Mech is the overriding force in control of the vehicle or machine and cannot be subverted or taken away. • Power up energy weapons indefinitely. • Must eat 2.5 lbs of metal to replace 1D6 lost MDC and a similar amount per week to maintain systems. If no metal is eaten a month will begin to lose 1D6 per month. A healthy character can regenerate at a rate of 1D6 MDC per minute up to 20 times per 24 hour period without needing additional material. • If reduced to zero MDC enters a coma/shutdown state as internal systems attempt repair. 10 MDC can be restored per 20 minutes until brought back to consciousness and 20 MDC points. Additional regeneration will require the consumption of metal. Can sustain damage of up to -99 MDC. Max. Jumping Ability: 19' (29') long, 9.5' (14.5') high. - Indicates free skill /w other skill. *+2 extra APM, plus those of the pilot. +1 additional 6, 9 and 12. *Critical Strike is the same as the pilot's. • Punch Damage: As per Robot (or Augmented) P.S. • Power Punch: Double damage, but counts as two melee attacks. • Tear or pry with hands: 1D4 M.D. • ]Kick Damage: As per Robot (or Augmented) P.S. • Body Block/Ram: As per Robot (or Augmented) P.S. punch damage. • Full Speed Running Ram: Double Robot (or Augmented) P.S. punch damage, plus 01-60% likelihood of knocking an opponent off his feet if the opponent is the same size or smaller (reduce by half if twice as big). Victim takes damage and is knocked off his feet, losing initiative and two melee attacks/actions. Impervious to vacuum, radiation, and toxins. Last edited by The Mechanic on Wed Mar 07, 2018 12:59 pm, edited 25 times in total. *** Depleting the M.D.C. of the main body will shut the armor down completely, and the pilot will be vulnerable to attack. Destroying one of the wings makes flight impossible, but the suit can still make jet-assisted leaps. Running: 60 mph maximum. The act of running does tire out its operator, but only at 20% of the usual fatigue rate thanks to the robot exoskeleton. Leaping: The powerful robot legs can leap up to 15 feet high or across unassisted by the jet boosters. A jet booster assisted leap can propel the unit up to 100 feet high and 200 feet across without attaining flight, or to make dives into the water 200 feet deep in 4 seconds. Water: The armor has aquatic propulsion capabilities and can move at roughly 40 mph through the water or it can walk along the bottom of a body of water (max depth 3,000 feet at 5 mph. Maximum Ocean Depth is 3,000 feet. Flying: The rocket propulsion system enables the Blue Hawk to hover stationary up to 400 feet or fly. Maximum flying speed is 290 mph, but cruising speed is considered to be 100-150 mph. Maximum altitude is limited to 2,000 feet. Flying Range: The nuclear power system gives the Blue Hawk 15 years of life, but the jet rockets get hot and need to cool after a maximum of eight hours of continuous flight; can fly indefinitely with brief rest stops along the way every 2-5 hours. Air Drill: All purpose drill. Three dozen drill bits, screwdriver heads and sockets kept in a compartment. Can be used as a weapon. 1 MD on a single strike or 2D6 MD per full melee around. Air Gauge: Measure the amount of air in tires and other items. Air Grinder: Used to file down pieces of M.D.C. metal. One MD per strike or 3D6 MD if held on for an entire melee around. Air Impact Drill: Used to loosen or attach armored plates. Unlike a normal drill it provides more torque. Has a dozen different attachments. Air Hammer: Can use numerous attachments. 1d4 MD as a weapon, 4D6 MD if held in place for a full melee around. Air Hose: Putting air in tires, etc. As well as blasting away dust and grime from machine parts. Jumper Cables: 12 foot reach. 2d5 SDC damage. Vibro Cutters: 1D4 MD for a cut or stab, 2D4 per melee cutting. *Has a small flap that opens or can be displayed on the Grease Hawk's HUD. *Built into the fingers are a variety of connectors and tools for a number of uses. *There is also a wireless system for properly equipped vehicles and robots. *The system diagnostic tool accesses the main computer and displays all of the results of diagnostic routines. This can be displayed graphically or in spoken words. *Sensors to detect heat, electrical currents, magnetic flow, polarity, fluids and so on. *+5% bonus to Computer Hacking, Computer Operation, Computer Programming, Navigation, Radio: Basic, Laser Communications, Sensory Equipment, TV/Video and Weapons Systems. Fingerjack: Similar to the cybernetic system of the same name. Hand Camera: A digital camera with a macro lens is located on top of the left hand. 20X Magnification. Hand Lights: Two small nodes on the left hand are a pair of LED lights used like a small flashlight. Laser Finger with Three Settings: 1d4X10 SDC, 1d4 MD and 2D4 MD. 4. Handheld Weapons (optional): Any handheld weapon can be used. Energy weapons are the usual choice because they can be powered by the UEL system. An additional side arm, Vibro-Blade, extra grenade reloads, and other gear may be carried on one or two belts around the waist. UEL – Universal Energy Link (2, one in each forearm): The Universal Energy Link is concealed under a layer of forearm plating. When needed, the plate opens and extends enough for the E-Clip connector of the UEL and cable to be removed and plugged into the weapon. The plate armor snaps back into place and a thin cable runs from the back of the forearm, near the wrist, from under the armor and to the weapon in hand. One concealed UEL is built into each forearm. No weapon over 1d6X10 MDC may be used. 5. Hand to Hand Combat: Rather than use a weapon, the pilot can engage in Mega-Damage hand to hand combat. Basic or Elite Flying Power Armor Training on page 351 or 352 of Rifts® Ultimate Edition. Damage is based on the Robotic P.S. of 26. Restrained Punch – 1D4 M.D. Full Strength Punch – 1D6 M.D. Power Dive Punch – 3D6 M.D., but counts as two melee attacks and all combat bonuses except to strike are reduced by half, including roll with impact. Leap Kick – 2D8 M.D., but counts as two melee attacks. 6. Sensor Systems & Features of Note: All those standard for power armor plus the following. Enhanced Sonar: 25 miles; 96 Targets. The Mecha must hover stationary above the waves (the cable for lowering the sonar probe is only 25 feet long) or moving at a slow speed (under 20 mph). Sonar readings start to come in after 1D4 melee rounds. Multi-Camera System - Macro and Telescopic: Range: 2 miles; 12x magnification. Can store 100 hours of video and 4,000 still images. Last edited by The Mechanic on Wed Oct 12, 2016 11:19 am, edited 8 times in total. The Mechanic is an alien. If someone were to meet him in a bar and say "Hello, What is your name?" "Mech." is what he would reply with. He has no idea who his people are, where they are from or anything about them. As far as Mech is concerned he is a natural born citizen of Earth and for the most part people would agree with him. He is roughly forty years old if his internal chronometer is accurate but there is no way to be certain. The only thing he knows of his origin is that he was raised to the age of eight or so by an operator somewhere near the great lakes. The man insisted that he 'found' Mech as a 'baby' and he can remember growing and developing but he was never told anything about the idea of parents, if he was found or anything else. For the longest time he suspected that he was a creation of that unknown operator but he does not believe so. For that part? Mech is not entirely sure what he is. He does not believe himself to be organic or alive but he does not consider himself wholly a machine either. He generally refers to himself as a cyborg as that seems to provide an answer that pleases most people. Occasionally he uses the term non-organic life form but generally finds the term robot to be incredibly offensive; along the same lines as suggesting that a minotaur is a cow or a centaur a horse. He is aware that he is more than the sum of his programming and mechanical parts which is a question that has haunted him all of his life. Magic is real on Earth. Religion is real, gods walk among people. Presumably the afterlife is a real thing. Does a non-organic life form have a soul? Does a non-organic life form find an afterlife? It was the search for these sorts of questions that eventually had him leave the company of his adopted father. Fully mature by age 8, he helped the man run a facility that kept mercenary units along the lakes in good repair and by the time he was twenty five he literally had gotten his hands in just about everything. With some few exceptions there was almost nothing that he could not repair. From birth he was cursed and blessed with the all consuming need to understand how things worked; something he always figured was a hold over from him being a machine. Eventually though, he and his 'father' parted ways after seventeen years of work. It was probably a more emotional parting for the human than for Mech who by that time had decided that emotions simply get in the way. Much to his chagrin as he'd find throughout his life, he couldn't get rid of them. Always grounding himself in the logic of being a machine, Mech was nonetheless close enough to a human that he felt the same things. Pride, fear, love, hate, curiosity, revulsion. His travels eventually led him to a company called Machiavelli Ordinance that was set to produce skelebot style drones. For awhile? That didn't go well until through hook or crook someone was able to get hold of a damaged alien core from the ruins of a facility near Kingsdale during the juicer uprising. Nobody knew where it came from beyond that but nobody really had any arguments either. He had been employed with them as a robotics scientist and engineer for some time and his ability to interface directly with the core was incredibly useful in the partial reprogramming that brought it back to 'life'. It would go on to be installed in their prototype unit, codenamed M.O.U.S.E.R. During the testing trials, Mech found that he was somewhat bothered by the questions brought into the spotlight over what he had done. Had he just literally reprogrammed what was effectively someone's brain? How sentient was this creature? Where did it come from? Did it hold any answers of his own origin? He took a few days of vacation to sort himself out and during that time the Coalition States raided and destroyed the company. Mech assumed the prototype destroyed, unaware that 'M.O.U.S.E.R' was still 'alive'. For a couple of years he simply drifted like a traveling operator, earning his keep by fixing this and that until he saw recruitment advertisements for Northern Gun. They were expanding research and development and passing himself off as an advanced cyborg he managed to secure a place in their ranks. He drifted through their robotics division but was eventually assigned to the development and testing of power armor, in particular the Red Hawk. Mech was on the team that developed the Blue Hawk from the Red Hawk. Under his suggestion other 'Hawks' were being considered. The Red Hawk had an advanced booster jet, the Blue Hawk had an underwater maneuvering system. Someone on paper even wrote up the idea of the 'Space Hawk' for an idea to see if they could find out what was destroying any satellite sent into orbit. At the same time, the Grease Monkey power armor was being developed and Mech began to rally some other designers around a project. The Grease Monkey was designed to repair giant robots, that was more or less it's sole purpose. It lacked the mobility to be useful elsewhere but was also quite cheap. Mech reasoned that if people were willing to pay more, why not give them more? They began with the Blue Hawk as a starting point. Removing the rifle to save weight and the forearm weapons to save space, they installed the tool equipment of the grease monkey along with the connectable diagnostic computer. This machine would be able to fly, go underwater, and respond quickly to repair needs on the battlefield. It was envisioned to be a hot seller and Mech was well rewarded for it. He enjoyed the comfortable lifestyle that Northern Gun gave him even if it meant he had to pretend to be something that he was not. He was respected by his co-workers for his creativity and ability to understand the intricate facets of just about everything mechanical. Until one day he found that the only thing he had left from Machiavelli Ordinance was blinking. A homing beacon. He'd forgotten about it; had the thing for years and found it stored away somewhere one day he was looking for something else. The M.O.U.S.E.R. unit was active. Immediately, he met with his superiors and told them the story. All of it. Honestly and to the best of his knowledge. Omitting of course the part about his being an alien. Just that he had worked for the company, been instrumental in developing the unit and now the advanced robot was active. A deal was made. 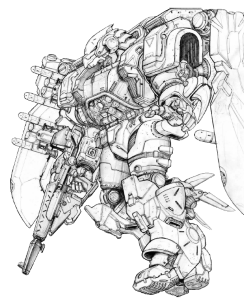 He was allowed to keep the armor that he was testing, which he affectionately called the "Grease Hawk" and given a leave of absence of indefinite time from Northern Gun's R&D department. However, if he found the unit he was to make a copy of it's schematics and deliver them back to Northern Gun. That worked for Mech, and putting together what little gear he had he headed in the direction of the fading beacon. Eventually, he encountered his target and the Roughnecks around a place called Tampico. After spending some time in their company and satisfying himself that the unit wasn't only in good hands but was developing far beyond what he expected, Mech decided that the best decision would be to continue to let him develop without his interference and check back again another time. So he parted company on good terms, taking to supporting himself as a traveling operator as he made his way across North America searching for something he found himself increasingly needing -- a meaning and purpose in life. PP increase purchased via EP. Note: Not yet added to stats. Also purchased OCC Related Skill: Boxing.